Talking about F1: The F1 blog: New Grand Prix Times article: Alonso, GP2 engines and all that – when did F1 get so precious? 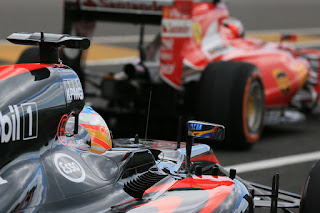 New Grand Prix Times article: Alonso, GP2 engines and all that – when did F1 get so precious? You'll no doubt be well aware of Fernando Alonso's comments over his team radio in the recent Japanese Grand Prix. Those with his, um, take on where his Honda power unit is currently in the competitive scheme of things. Probably too you'll be aware of the wider reaction to it all, with some predicting severe consequences for the Spaniard and his relationship with his team as well as with his engine supplier. For me though it was rather a storm in a teacup, but the reaction described did bring renewed focus on a broader question that I've chewed over for a while. That of when exactly did F1 get this precious? After all, the apparently offended response doesn't appear to be in keeping with other aspects of how the sport likes to view itself. It certainly wasn't always this way either.